One of my favorite reasons to get excited about cooler weather is the endless possibilities for soup. I love making a big pot on a Sunday and just letting the aroma fill my apartment while we watch football in the background. Recently I've been on the hunt for some good recipes to pull me out of my "chicken soup" box and thought I would share some of the gems I came across via Pinterest. Don't they just look so delicious and cozy? I love making soup on the weekend then living off of it for days! I attempted to do that on Sunday, but I totally forgot and ended up cooking off all the liquid and burning it. #fail. GRILLED CHEESE CROUTONS ARE YOU KIDDING ME?!?! Making my favorite Butternut Squash soup Tonight! Those all look so delicious! I have to try that sweet potato with cauliflower soup! Grilled cheese croutons are my FAV. Seriously, they make tomato soup even better (if that's possible). Those grilled cheese croutons look soooo good! That sweet potato cauliflower soup looks AMAZING. I'm definitely bookmarking it for later. It's seriously delicious, super easy, and freezes perfectly. YUM! These sound delish! Especially the broccoli/spinach with avocado toasts. I will be sure to try these out. I LOVE soup in the fall too! YUMMy! I just ate lunch but I could have a cup of any of those please! Bacon black bean soup is my favorite :). YUM! 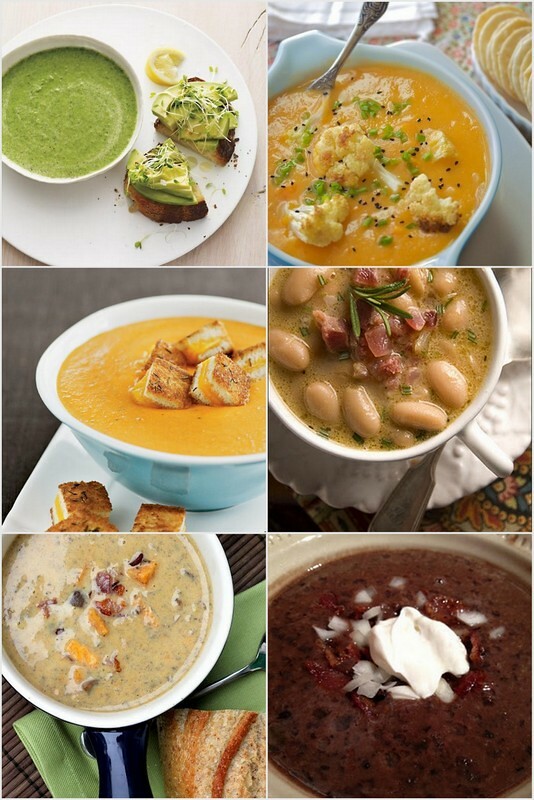 Those soups look really good! I might have to check out those recipes and make one for dinner next week!